Why is it I always get the RETARDED CART when I go shopping? It squeaks loud enough to make dogs cry within a three-mile radius (and it NEVER DOES IT right off, only after you push it about twenty-five feet inside the door). That's when you hit the point of no return. You can either step AWAY from the cart like you don't recognize its existence and then sneak back for another one, but those cashiers watch you. Worse, if you are a regular at the grocery store, they frown at you, or laugh. There is no clean get away with that maneuver. If it's not a squeaky cart, it's one that has a flat spot on one wheel, making it go, "thumpity-thump-thumpity-thump" as you push it along. 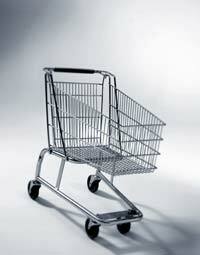 Those silly carts also have that initial twenty-five to forty foot handicap where it acts normal. Does it just warm up to you, decide you are committed to it for a long-term relationship and decide to expose its true nature and you'll still love it regardless? Sometimes, you think you've got a winner, right up until you put something heavier than a bag a potato chips in the cart, like say, a 21-pound container of cat litter, or even a 1 gallon (equals 8 pounds) or milk, suddenly the cart goes berserk and one wheel actually leaves the floor and you are pushing on three. Then the whole thing goes "Screee-Thump-Scree!" as you push it along. And then there is always the old standby, the cart that will NOT turn. It'll either go straight ONLY, or list to the left or right just like a sailboat in a bad gale. There are other examples but these are just a few, and I must be the RETARDED CART magnet. Last Friday, my daughter and I went to finish up some Christmas shopping. Each of us gets a cart. My daughter sails along with a fully functioning cart, just as they are meant to be (I've heard of these but haven't set my hands on the push bar of one in many a year, a decade at least), and I get one that not only goes "thumpity-thump-thump" but steers drunkenly and determinedly to the right. My daughter simply assumes that's how carts should be, the working ones. She NEVER gets a RETARDED CART. Now I have given birth to her, raised her with many sacrifices, she's given me gray hair, stretch marks, and pushed me to a borderline stroke condition on countless occasions…but will this teenager trade carts with me? Not a chance. So, there I go amid the crush of about the population of at least two or three third world countries all within the doors of Walmart…and I'm pushing the RETARDED CART! I get stares of pity as I struggle along trying to read my list and keep the cart going in a straight line down the aisle. After ten hours at work and two hours in that store trying to locate items on my list, price checks, trying not to mow down tykes with my errant cart, my patience threshold fell to an all-time low, which was only exceeded by my exhaustion levels. I had reached the point of not caring if anybody got ANYTHING on Christmas morning. About the only thing I would enjoy would be watching this cart go through the smelter back at the steel forges—wherever THEY are nowadays. Hey, I'm all for recycling. Any politician who promises me a NON-RETARDED cart (even though NOT PC), I'd vote for. This year's elections are over. But next time around, I'm looking for a platform from a politician who promises me a shopping cart that works, that all the RETARDED CARTS go back to the foundry and melted down to become staples in their next lives.